New Jersey to rejoin Regional Greenhouse Gas Initiative Program (RGGI). On December 17, 2018, the New Jersey Department of Environmental Protection (NJDEP) published two rule proposals to facilitate the state’s re-entry into the Regional Greenhouse Gas Initiative (RGGI) program: the CO2 Budget Trading Rule and the Global Warming Solutions Fund Rule according to a January 25, 2019 Trinity Consultants report. RGGI is a market-based initiative that establishes a regional cap on carbon dioxide (CO2) emissions and requires fossil fuel fired electric generating units that serve an electricity generator with a nameplate capacity equal to or greater than 25 megawatts electric (at any time on or after 1/1/2005) to obtain an allowance for each ton of CO2 emitted. 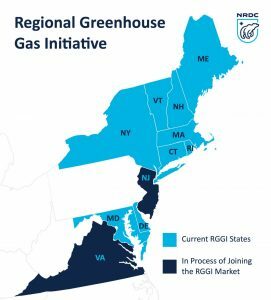 Nine states currently participate in RGGI with New Jersey scheduled to enter their first auction in 2020. Affected plants may comply by purchasing allowances from quarterly auctions, other generators within RGGI, or through projects that offset CO2 emissions. The funds from allowance sales will be split between participating agencies; the NJDEP, the NJ Board of Public Utilities (NJBPU), and the NJ Economic Development Authority (NJEDA). Consistent with the New Jersey Energy Master Plan, the rule encourages cogeneration arrangements by offering either a fixed price sale offer of CO2 allowances or allowing for compliance obligation adjustments (deductions resulting from the generation of useful thermal energy and electricity directly supplied to the partner facility). In order to be eligible for either of these incentives, sources must provide documentation by submitting either an affidavit that the sources meets the obligation of “certified dispatch agreement facility” or an annual application for the compliance obligation adjustment. With New Jersey’s re-entry into the RGGI program, regulated entities will be required to include CO2 Budget Trading Rule requirements, including requirements for monitoring and reporting, into their Title V permits. The emissions monitoring and reporting requirements for the CO2 Budget Trading Program rely on and closely mirror EPA’s rules for emissions monitoring and reporting at 40 CFR Part 75. These requirements will be incorporated into a source’s Title V permit at the time of permit modification or permit renewal, whichever comes first. A copy of the rule proposals, fact sheets and more information about RGGI can be found on two NJDEP’s websites at http://www.nj.gov/dep/rules/notices.html and https://www.state.nj.us/dep/aqes/rggi.html. Comments are being accepted through February 15, 2019 with public hearings scheduled for January 25, 2019 in Trenton. Contact MIRATECH for help achieving stationary engine emission control.